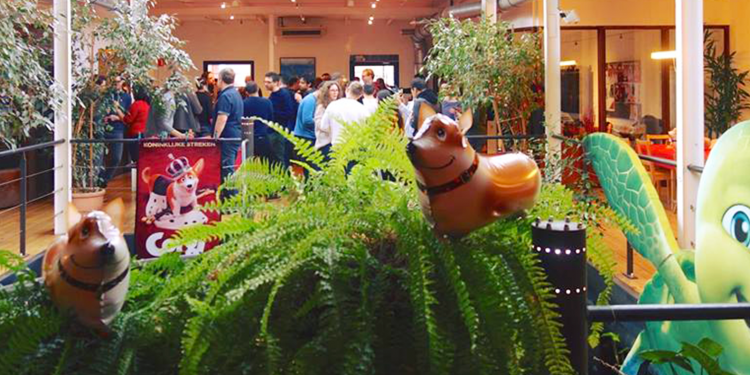 Brussels, February 8, 2019 – True to its tradition, the nWave studio screened its latest animated feature film, The Queen’s Corgi, in a private screening destined to all its employees. The movie projection took place at the White Cinema, owned by Belga Films. At 10:00 AM sharp, members of the artistic, accounting and distribution departments engulfed in the dark room to take their seats. There’s something exhilarating about seeing the names of the people you work with and admire included in a movie’s end credits and, when the movie ended, everybody present applauded each other’s hard work. The private screening was followed by a festive meal, served at the nWave headquarters. Everybody celebrated as the party went on. Watch the official trailer for The Queen’s Corgi below and follow our social media to stay informed about the movie’s release dates.